Redefining Importance of Nitrate During Haze Pollution to Help Optimize an Emission Control Strategy: "The NOx Hypothesis"
Haze pollution caused by particulate matter suspended in the air remains a major environmental issue because of its substantial impacts on climate, air quality, and human health. It has been reported that large fractions of both organic and inorganic matter contribute to PM2.5 (aerodynamic diameter less than 2.5 μm) and induce severe haze pollution in urban China. It is also widely recognized that the mitigation of VOC, NH3, SO2 and NOx precursors aids in reducing PM2.5, the key factor in visibility degradation. However, it is impractical to control all precursors at the same time when their geographical locations and emission strengths remain unclear. Thus, control strategies for these various precursors still remain critical challenges. 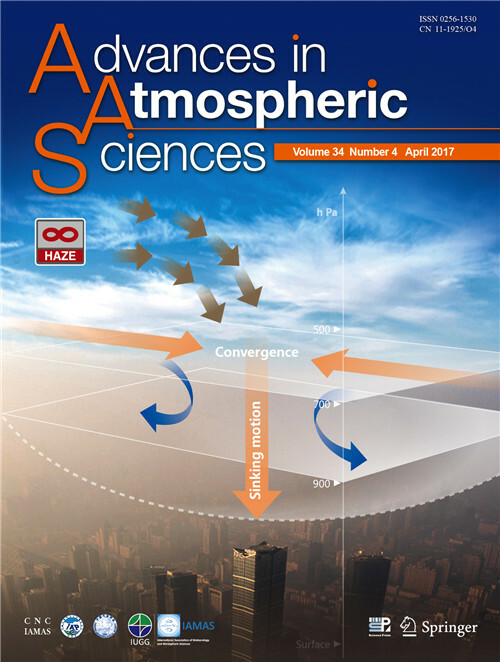 Prof. WANG Yuesi and coauthors from Institute of Atmospheric Physics, Chinese Academy of Sciences propose the “NOx Hypothesis” that NOx mitigation will not only reduce nitrate itself but also might intervene with secondary aerosol formation in a recent publication in peer-reviewed journal of ATMOSPHERIC ENVIRONMENT. 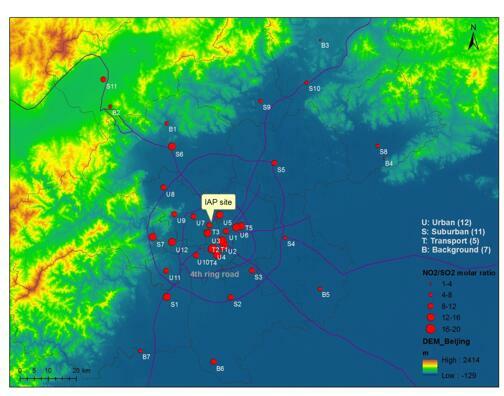 Based on on-line and off-line aerosol measurements in urban Beijing for both clean and haze conditions, they demonstrate that the absolute mass concentration and relative percentage of nitrate increased with visibility degradation (relative humidity), whereas the variations of organics tracked the patterns of mixing-layer height and temperature (Figure 1). They propose that the increase in the relative contribution of nitrate to PM1 observed during the early stages of haze pollution was due to new particle formation (Figure 2), whereas the nitrate formed in PM1-2.5 during the latter stages was due to heterogeneous formation and hygroscopic growth (Figure 3). 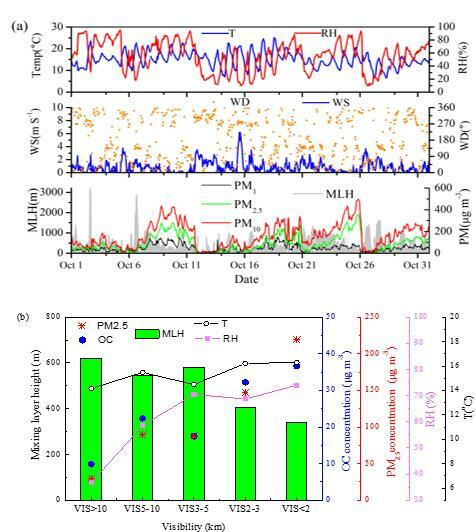 The increasing trend of nitrate (and also sulfate and ammonium) but decreasing trends of organics during haze development, together with the increase of the NO2/SO2 molar ratio with increasing proximity to downtown Beijing and with visibility degradation (Figure 4), provide further evidence that controlling NOx emissions should be a priority for improving air quality in mega cities. Additional large-scale investigation is required to adequately characterize the regional features of NOx-induced haze pollution in China. Such studies may provide insight into the formation of critical nuclei or the subsequent growth of freshly nucleated particles and advance our understanding of the role of nitrate in new particle formation. The average density of PM 2.5, fine particulate matter that causes smog, in the Beijing-Tianjin-Hebei region dropped by 26.5 micrograms per cubic meter, or 30 percent, from 2013 to 2016, according to satellite data released by the Chinese Academy of Sciences (CAS) Wednesday. Raman-Mie Lidar (RML), a double wavelengths (532 and 1064 nm) Nd-YAG laser is employed as emitting source, which was developed by Lidar group at Anhui Institute of Optics and Fine Mechanics (AIOFM), Hefei Institutes of Physical Science.